The Vermont chapter of the American Institute of Architects held its year-end meeting, award ceremony and all-around party on Saturday night at ArtsRiot in Burlington. Board president Gary Corey opened with the news that “this will be a good year and a bad year” for architecture in Vermont. Good because membership is up — Vermont’s chapter is now the third largest in New England — and “bad because of the election.” Architecture, Corey said, will likely suffer under the new administration. “Impeach Trump!” an architect in the audience yelled out in response. While it’s good to prepare for the future, the awards given this year put the recent past in excellent stead. Some interesting work has lately gone up in the Green Mountains. (And one to-die-for ski chalet in Québec). While AIA awards technically honor “design excellence,” there’s no accounting for the criteria jurors bring to bear each year. State chapters of the AIA generally jury each other’s annual awards, a well-intentioned effort at impartiality that results in a different range of awards each year. Last year’s jury from Montréal honored structures in four size categories, from large to extra-small projects, with two winners in most categories. This year, five AIA-Colorado architects sifted through the 50 projects submitted by Vermont architects and recognized one Honor winner (Wood Shed), four Merit winners (the Burlington public housing, Middlebury College’s Virtue Field House by Sasaki, Two Shed and that Québécois ski chalet by RobitailleCurtis), and two Citations (the Barre public housing and the ice shanty). Refreshingly, the jury actively sought to honor affordable housing, noted Diantha Korzun, chair of the awards committee and a principal at gbA Architecture and Planning. There is an art to achieving design excellence on uninteresting lots with severe budget restraints. Duncan Wisniewski’s Bright Street — a 35-unit housing block in the middle of the trapezoid between Archibald Street and Riverside Avenue, fronted on Bright by two duplexes — achieves this by paying visual respect to the neighborhood, among other things. As Michael Wisniewski explained, the two-story duplexes, between which one approaches the three-story apartment complex, take their cues from the buildings around them. The left one is gabled like the houses to its left; the right is flat-roofed, as are the industrial buildings on that side. And the bold accent colors, one a mango orange, echo the signature vivid colors of area rental properties owned by landlord Stu McGowan. With its giant house numbers, cladding of overly wide fiber cement panels, hidden underground parking and community gardens planned for the Archibald Street approach, this urban-infill, affordable cooperative housing project must have made its clients, Housing Vermont and Champlain Housing Trust, rather proud. Of course, projects with generous budgets usually win greater acclaim than do low-budget ones, as was the case with Wood Shed. But the Colorado jurors nevertheless seemed drawn to the private residence’s distinctively unglamorous aesthetic. 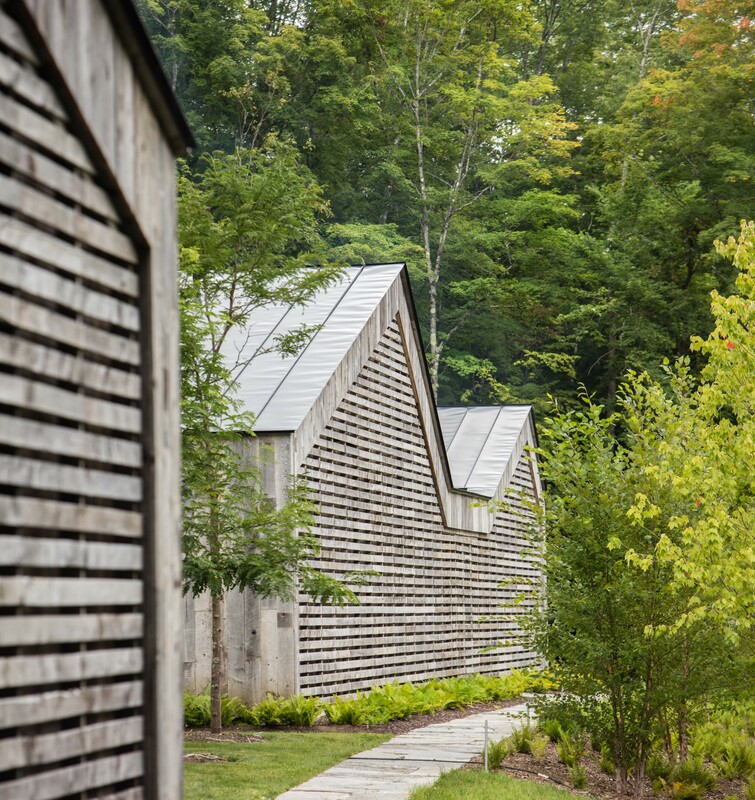 Wood Shed’s inspiration is, well, the wood shed, a ubiquitous vernacular structure that the architects deem “iconic” in Vermont. These low-slung sheds are unpainted and humble, with asymmetric gable roofs — that is, roofs that come to a point off-center — and walls of wood planks nailed on without concern for gaps. Birdseye’s 3,500-square-foot guest house in unpainted clapboard evokes both features in a structure that is more beautiful for its restraint. Resembling two single-story houses connected by a covered entry hall, the ensemble’s road-facing façade is one continuous “scrim” of thin horizontal boards and nearly as thin reveals between them: a wood shed wall, but reimagined. The actual wall behind it appears to be glass, and the entry door is so well integrated into the design that it’s nearly invisible. The opposite façade opens to views on the surrounding wood through long, wrap-around windows on the two gable structures. Between them is an outdoor seating area with a fireplace. Much could be said about the beauty of Middlebury College’s new field house, which Sasaki sank 12 feet in order to lower its profile, and its fellow Merit and Citation winners in greater detail. Jesse Beck of Freeman French Freeman, who recently helped jury the Rhode Island chapter’s awards, commented that all the Vermont award winners demonstrate an impressively high level of design excellence. But one more project — the Laurentian Ski Chalet, located 35 miles northeast of Mont Tremblant — deserves mention for several reasons. For one, the chalet is RobitailleCurtis’ first built project. And the firm, based in both Montréal and Burlington, just joined AIA-VT this year. But the award doesn’t surprise. The chalet fits four bedrooms, two and a half baths and a seemingly endless windowed living-dining space into 2,750 cleanly designed square feet. The structure is cantilevered over a steep drop that used to be a downhill ski trail; red cedar pilotis leave the land underneath undisturbed, and the roof line mirrors the mountain’s pitch. An “entry bridge” on the uphill side accesses the main floor, where kitchen, dining and living areas are arranged in a line to face one, long, uninterrupted view across the valleys below. If that gets boring, you can face the other way on the 27-foot-long window seat. The outdoor spa, steam room, Belgian fireplace and generous outdoor decks all provide extra reasons to do nothing but sit around and marvel at this particular instance of the built environment. In photos, that is. Visit aiavt.org to see shots of all this year’s winners.